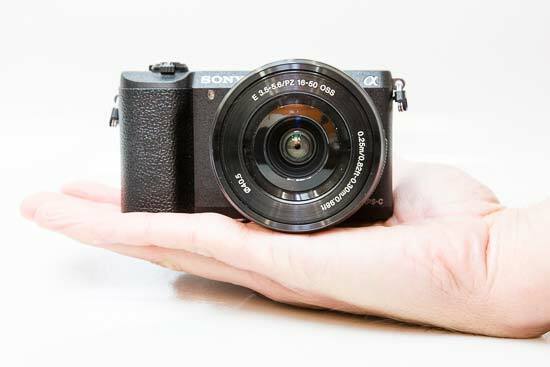 The Sony A5100 is the world’s smallest, lightest interchangeable lens camera with an APS-C sensor, built-in flash and Wi-Fi connectivity. Successor to the 6-month-old A5000 model, the Sony A5100 features a 24.3 megapixel Exmor APS HD CMOS sensor, Fast Hybrid AF for optimal fast and precise autofocus as quick as 0.06sec with 25 contrast-detect and 179 phase-detect points covering 92% of the image, BIONZ X processor, a sensitivity range of ISO 100-25600, full HD AVCHD (60p/50p/25p/24p) recording including support for the XAVC S video format at 50Mbps and clean HDMI output, a 3-inch 180° tiltable touch enabled LCD panel with 920k-dot resolution, built-in pop-up flash, a zoom lever, 6fps burst shooting with subject tracking, 1,200-segment exposure meter, Auto Object Framing mode, a range of Picture Effects, wi-fi and NFC connectivity, and 400 shot battery life. 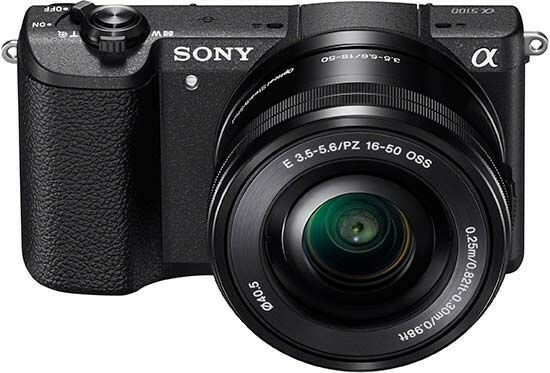 The Sony A5100 is available now in black priced at £420 / $549.99 body only, £550 / $699.99 with the 16-50mm power zoom lens, and £760 with the 16-50mm power zoom and 55-210mm lenses. 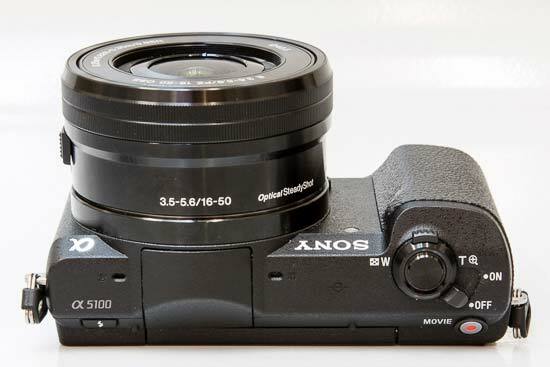 The new Sony A5100 is virtually identical to its predecessor, the A5100, the main changes being internal rather than external. 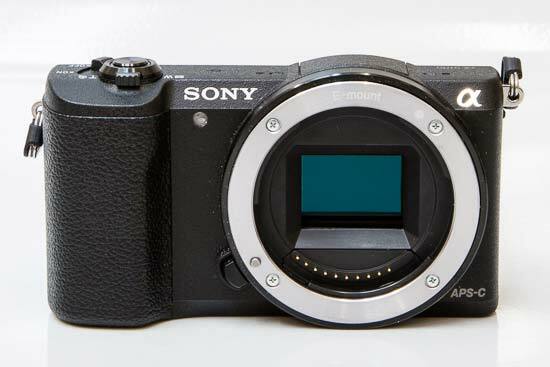 The A5100 weighs a mere 224g and measures 109.6 x 62.8 x 35.7 mm. Despite weighing so little (admittedly without the lens and battery fitted), the A5100 still feels solid gripped in the palm, with a tall, large grip with a subtle indentation near the top. 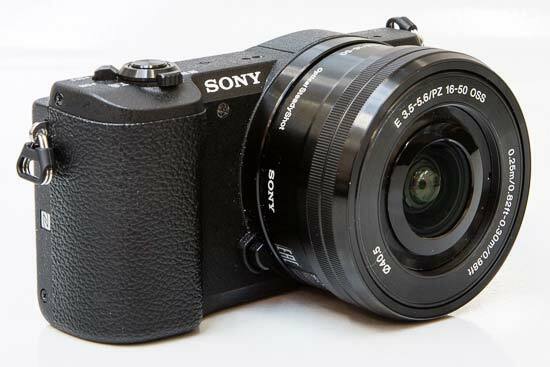 With the supplied 16-50mm power zoom kit lens attached the Sony A5100 doesn't look or feel too top heavy, as the lens retracts back into itself when not in use, making for a very compact overall package, although the tiny body isn't such a good match for some of the larger E-Mount lenses. The downside of using a collapsible power zoom is that it causes start-up (and wake-up) times to be longer than usual. Those who aren't keen on the idea of shooting with a power zoom can of course buy the camera in a body-only configuration. The 3 inch LCD screen on the rear of the Sony A5100 can be tilted back and forward through a full 180° - if not, unfortunately swung outwards at 90° - to allow for low and high angle compositions we might not have attempted without. You can even fully turn it to the front, proving very useful for those ubiquitous selfies, although you can't close it inwards against the camera body to help protect it. New to the A5100 is higher resolution and touch-screen control, something that it's bigger brother, the A6000, doesn't offer. Although it's limited to either setting the focus or firing the shutter, being able to track your subject or take the picture simply by tapping the screen is a nice upgrade from the previous model. The A5100 also offers much improved video shooting, with full HD AVCHD (60p/50p/25p/24p) recording with stereo sound and the added bonus of XAVC S video format at 50Mbps (if your memory card supports it), which is based on the professional XAVC codec and records full-pixel readout Full HD video footage at up to 50Mbps. The consumer A5100 is the second Alpha-branded camera to do so after the much more expensive full-frame A7S camera. It also features a useful dedicated red camcorder-style video record button for instant thumb-operated video access on the rear, although it's a little too recessed into the camera body for our liking. Low light sensitivity without flash also theoretically looks set to show rivals a thing or two by ranging from ISO 100 to a maximum ISO 25600 equivalent setting. Impressive stuff, and matching the sort of spec we're used to seeing on mid-range DSLRs. There's no in-body image stabilisation offered by the A5100 unfortunately, so this is via the lens only. It appears to work well, at least as effectively as the in-camera or lens based anti-shake methodology deployed by rival brands. The A5100's design is pleasingly pared-back, particularly when viewed from the front. Sony branding and black plastic DSLR-style lens release button aside, all we find on the faceplate is a small porthole-shaped window for the AF assist/self timer lamp, and the handgrip with a dimpled surface for a firmer hold. Oh, and the "APS-C" moniker just in case you want to brag about the size of your sensor to your Micro Four Thirds friends. The top plate looks similarly functional rather than fashionable. The A5100 is turned on or off via a flick of a chunky, nicely rigid switch to the far right, rather than via the recessed button that we usually find on cameras with such a small form factor. Do this and it's a wait of 1-2 seconds before an image materializes on the LCD allowing the first shot to be framed - slightly slower than we expected in this regard, and no match for a DSLR proper. 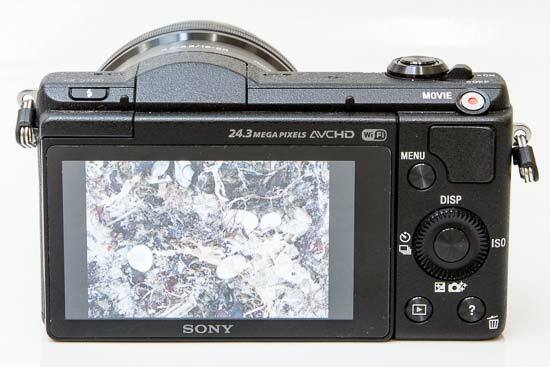 One feature on the A5100 that's designed to make it more accessible to upgraders is a power zoom switch, very similar to that found on many compact cameras. This allows the 16-50mm kit lens to be zoomed in three different ways; using the zoom lever on top of the camera, which is good for one-handed operation, via the zoom ring on the lens, and finally using the zoom control on the side of the lens. If you don't have a power zoom lens attached, the the zoom lever less adjusts the digital zoom instead (it that's enabled), and it can also be used to zoom during image playback regardless of the lens that's fitted. Also positioned atop the camera is the integrated pop-up flash, positioned inline with the centre of the lens. Note that the A5100 doesn't offer an accessory port for attaching optional accessories like the FDA-EV1S electronic viewfinder or the ECM-SST1 microphone, unlike the more expensive NEX/Alpha models. Two small holes either side of the flash for the stereo sound complete the camera's top-plate. Press the Menu button on the rear and six icons appear on screen - Camera Settings, Custom Settings, Wireless, Applications, Playback and Setup (this step can be turned off). Choosing one of these opens a text-based menu system with with white text on a black background aiding visibility. The six Camera Settings folders allow users to select image size, ratio and quality and - if JPEG (RAW and RAW+JPEG also available) - compression rates too, plus features like long exposure and high ISO noise reduction - all in fact activated as a default, and also contains the video quality and audio options, while the four Custom Settings folders allow you to tweak the A5100 to your way of working. Just like Olympus and Panasonic, the Sony A5100 offers a range of creative Picture Effects, including posterisation, partial colour, retro, high-key, mono and toy camera. These effects can also be applied when using the Intelligent Auto shooting mode. The Soft Skin mode automatically retouches portraits, removing any minor blemishes and wrinkles for a more conventionally good-looking appearance. The Auto Object Framing mode uses face detection, By Pixel Super Resolution technology and the rule of thirds to automatically take better pictures of still lifes, moving subjects and macro close-ups. Sony's catchily named Pixel Super Resolution Technology ensures that the resulting image is still a full 24 megapixels in size, and the original uncropped image is also saved for easy comparison. The A5100's external backplate is once again a sparse affair, the majority of it taken up by the 3-inch widescreen ratio tilting LCD that stretches from base to top plate. To the right of this are the main controls, with the aforementioned Menu button at the top. Underneath is a scroll wheel, used to move through the various menu options and make selections, which has its own central, unmarked set button. Th scroll wheel is quite responsive to the touch, which, on a positive note, means that tabbing through options is a swift process, but on the other hand it's easy to slip past the setting you actually wanted when hurrying through them as a photo opportunity suddenly presents itself. 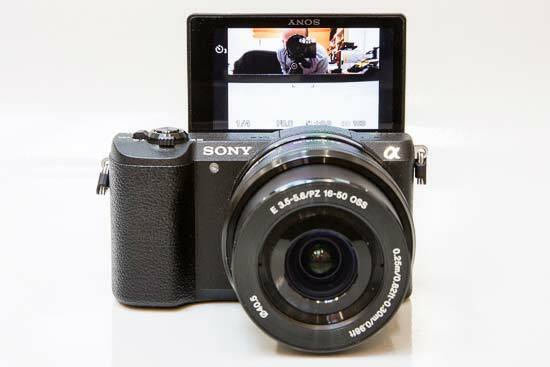 As denoted by symbols on the side of the camera, the Sony A5100 is wi-fi and NFC capable and the functions can be adjusted in the Wireless main menu. You can choose to transmit the images to either a smartphone computer, or a compatible TV set. One cool feature of the wi-fi is being able to link the camera to your smart phone using the PlayMemories Mobile app. You can then use the phone as a remote so those outstretched arm 'selfies' will be a thing of the past. The A5100 also features NFC (Near Field Communication) technology (the same technology that's used for mobile payments), which allows you to connect it to a compatible internet enabled device or another NFC-enabled camera by simply tapping them together. You can also use the WPS Push option to locate a hot spot, access settings, edit the device name, display the MAC address or format all settings if you wish. In addition to the built-in wi-fi/NFC connectivity, the A5100 supports PlayMemories Camera Apps. As the name suggests, this is a downloadable service that lets you add new functionality to the camera, either via wi-fi or USB connection. Smart Remote Control, which allows you to control the exposure and shutter release via your smartphone, is preinstalled on the A5100. Other optional apps available include Picture Effect+, Bracket Pro, Multi Frame NR, Photo Retouch and Direct Upload, and Sony plans to provide more new apps in the near future. Note that only some of the apps are free. Peaking is a feature that provides a level of hand-holding for manual focus users. When turned on to one of the three levels (low, mid, high), this essentially draws a coloured line (red, white or yellow) around the areas of highest contrast in the image when you're manually focusing the camera. Used in conjunction with the magnified focus assist, this makes it a cinch to focus accurately on a specific part of the subject, something that the majority of digital cameras have struggled with. It can even be used in the movie mode, which along with the Zebra function again provides a real boon to your creativity. At the base of the A5100 we find a metal screw thread for a tripod directly beneath the lens mount, and a compartment storing the rechargeable battery. The memory card slot is located on the left-hand side of the camera when viewed from the rear, here Sony reaching out to a wider audience by offering SD/SDHC/SDXC compatibility alongside its own Memory Stick. The left hand flank is also where users will find a covered port for HDMI connectivity and Sony's Multi port. Only the USB cable was provided with our review sample; there's no standard definition AV output. There's also a small built-in speaker for reviewing audio in the field on the bottom and protruding metal strap eyelets on either side of the camera.